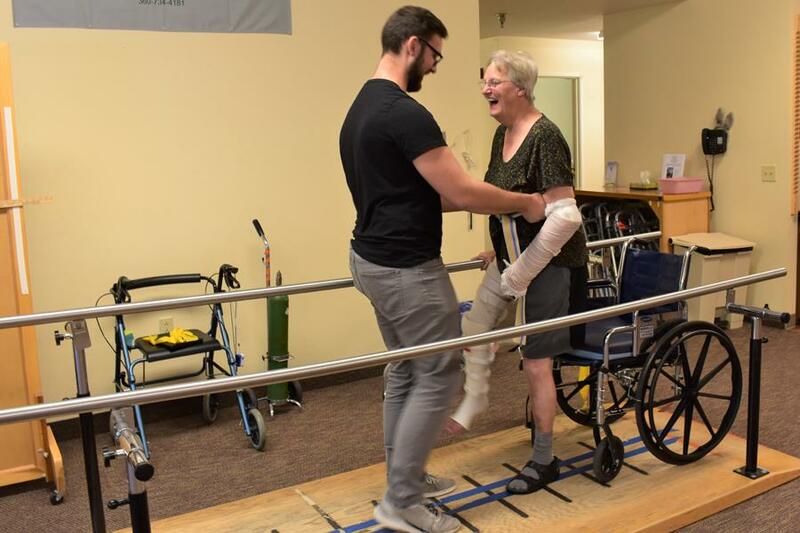 View Ridge Care Center provides its community of residents with full-service, professional, in-patient and out-patient rehabilitation services including physical, occupational, and speech therapies. Our contract with Infinity Rehab allows us to provide our residents with consistently professional, reliable, and effective therapy sessions. Incorporating unique measures that maximize the therapy benefits of every care plan, residents can meet their physical goals more quickly and transition back home in a timely manner. It is our goal to help you succeed which is why we utilize a team approach. Our rehabilitation team consists of our therapists (including physical, occupational, and speech therapy professionals), your primary care physician, our nursing staff – and, most importantly, you. Together, we collaborate to evaluate, plan, provide, and continually reassess, making sure to adapt our approach to fit each unique situation as it arises. We incorporate state-of-the-art equipment within our spacious gym and treatment techniques that accelerate the healing process while encouraging active participation from family members and other caregivers to further enhance the healing process and ensure lasting results. We want you to maintain what you have regained during your time with us. Prior to discharge, we will provide patient and family education as well as conduct home evaluations to guarantee a safe transition back home. At this time, if your physician deems out-patient rehab a necessity to continue the healing process, our therapy team (with whom by now you will be very acquainted) is available to provide those services for you in the comforts of your own home. In addition, we will provide you with community resources and programs, including adaptive equipment orders, family training, and wellness programs, so that you can continue to thrive. Our goal is for each resident that goes through our therapy program to achieve their maximum level of independence and remain in the least restrictive living environment.